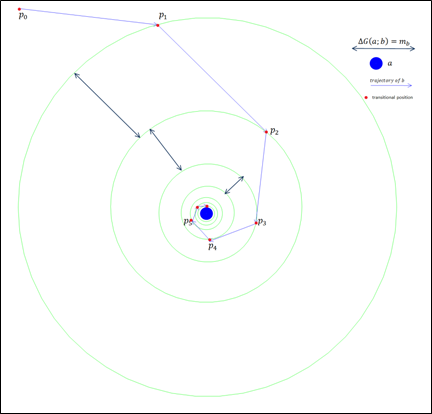 The laws of motion we have explained in earlier articles can be used to calculate and predict the position, speed and trajectory of an object from any initial state. Let’s consider the simple case of an object interacting gravitationally with an object . We know from a previous article that for any object, changes in momentum must be multiple integers of its mass. That is, where . This implies that changes in momentum of an object due to gravitational interactions occur at positions that are at distances from the center of gravity of such that . We will call these positions transitional positions. The spacing between the transitional positions along the trajectory of depends on its mass. The greater , the closer the transitory positions will be. Based on the QGD gravitational interaction equation, , we see that the spacing between the transitional positions is very nearly proportional to the square of the distance between and (see figure below). Gravity induced changes in momentum occur at transitional positions are always equal to which corresponds to changes in speed that are equal to or . It follows that the speed of between two subsequent transitional positions and is constant and equal to . The momentum vector providing both direction and the speed until it reaches the next transitional position, the previous or subsequent locations of can be calculated from an arbitrarily chosen initial position . It is important to remember that classical time being a notion that has no physical meaning the distance travels is relative not to the mathematical dimension of time but relative to a chosen number of preon(+) leaps of any given preon(+) chosen as reference. The time reference is therefore replaced by a distance reference. For example, we do not talk about the distance an object travels over units of time, but rather the distance it travels will over preon(+) leaps. That is, where is the distance travelled, the speed of , the number of leaps and the momentum of preon(+), which is also equal to its speed. Note that the although the reference we have used here plays a role similar to that of the classical notion of time has played in physics, it differs from it in that is based on a fundamental aspect of physical reality; the preon(+) leap which is the fundamental unit of distance. Thus, a fourth dimension, even a conceptual one, is unnecessary. Reality can be fully described without the concept of time or the purely mathematical dimension of time. As we have seen above, the QGD laws of motion allows us to know the momentum, speed, direction at any position along the trajectory of a body. To better illustrate the law of motion, we will consider the classic example of a body for which , that is, is a free falling body. , the speed at is equal to . Thus the rate acceleration of a body is proportional to the mass of and to the square of the distance of between its initial position and the center of gravity of , but is independent of the mass of , which explains why two bodies will have the same acceleration regardless of their mass. This is consistent with Newton’s law of gravity, which at the scale it is applied to, distances in leaps are large enough so that . Newton’s law of gravity emerges from the principles of QGD and corresponds to an approximation of its gravitational interaction equation. The distance between two successive transitional positions is proportional to the difference between the square of their distances from the center of gravity. This is also consistent with the inverse square of the Newtonian equation (see figure below). As we have seen, according to QGD, an object interacting gravitationally doesn’t go through the infinite number of infinitesimal speed increments implied by Newton’s gravity equation. An object accelerates only at transitional positions. At non-fundamental scales, the relative distance between transitional positions is small and the acceleration of an object appears continuous. But the closer we get to the fundamental scale, the more evident it becomes that the acceleration is discrete rather than continuous. This is consistent with observation (see quantum leap). Based on the notions we have introduced in this section, the discrete acceleration of objects at transitional positions should be observable. 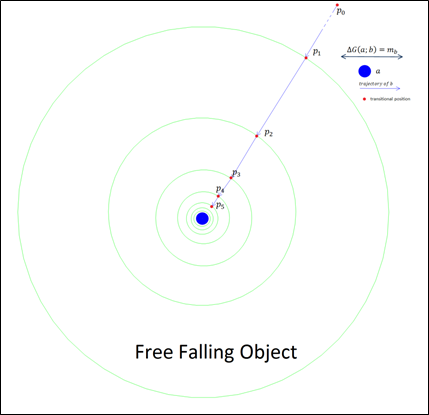 Data from a free fall experiment using an object coupled with a precise enough accelerometer should show that the speed of an object changes at transitional positions and that between them, its speed remains constant. This entry was posted on Tuesday, June 18th, 2013 at 7:10 pm	and is filed under Quantum-Geometry Dynamics. You can follow any responses to this entry through the RSS 2.0 feed. Both comments and pings are currently closed.